No one likes moving. In fact, people say that it is one of life's most stressful events. No matter how many times you have moved in your life, it never gets easier. There is just always so much to do and to organize. And it never seems to end. And it's not any easier if you're moving close by. You seem to have one list after another and no matter how early on you start planning for it, there's just always more to do. So that is why it is worthwhile finding out if there are good people whom you can hire to make this whole thing just a little bit easier. Make sure you get recommendations from different moving companies and then also check out the move in, move out cleaning companies too. At Denver Move In and Out Cleaning, that is exactly what we are trained to do. 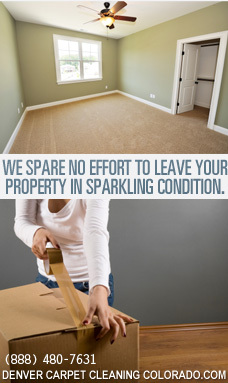 Our experts our trained to alleviate a lot of the stress that is a natural part of moving. We understand just how disappointing and frustrating it can be for you to move into your new home, only to find it infested and filthy. You think you've finally finished bringing all your belongings over and you can actually sit down, but the place is so horrific that you just want to run away. Well, that is what Denver Move In and Out Cleaning is there for. By the time you get to your new home, it will be cleaner than it ever was (and probably ever will be again!). And, as well, Denver Move In and Out Cleaning will take care of the cleaning from your old place too so that it is one less thing for you to have to think about. So don't let a difficult situation like moving be even more of a pain for you, call Denver Carpet Cleaning and let us ease the stress.